This is an earlier book by the author of "I Had the Strangest Dream" dream dictionary which she suggested I read as the Inner Goddess Queen was referred to in the dream book and I didn't know what it was. 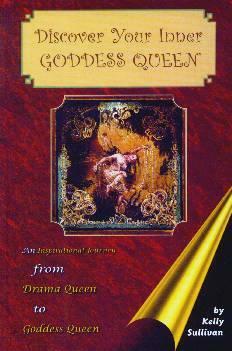 Goddess Queen captures "the essence of the divine feminine in both its heavenly and earthly state," says the Rev. Nirvana Reginald Gayle in the book's foreword. "Always remember that within you is a divine part of infinite intelligence that exists above the clouds of your human, limited, linear thinking" says Kelly Sullivan. I thought it was our Spirit Guide. I don't get this "pie in the sky" philosophy. What will getting "a swatch of colorful fabric that inspires you, carry it around with you today" going to help things in my life? The book lays out steps (Pearls of Wisdom) to take to find your inner Goddess Queen, but it feels like you're being addressed as though you were a child. For example, the question posed after this statement: "There are millions of women on the planet, but there is really only one Goddess Queen" (Who is my Goddess Queen?) doesn't make sense. If any of this works for you, hey, go with it. Whatever floats your boat. For me, there's too much time spent dreaming, writing, and making notes - a prayer takes two minutes, a "thank you" just five seconds. I always think if you want to be taken seriously as an author, you've got to write seriously. By making up words you lose credibility. And, the "contracts", a joke in my opinion. Conclusion - I'll stick with God, Mother God, Jesus, and my Spirit Guide. Know them, love them, trust them - my feelings.